Smoking is more than just a bad habit. It’s an addiction cycle with physical, psychological, and behavioral implications that requires a serious plan to break. Quitting is a major life change, so before you embark on your journey to a smoke-free life, it’s important to understand what to expect, and to create a strategy to overcome obstacles along the way. Read on to learn how you can create an effective plan to quit in six steps. Before embarking on a journey to quit smoking, it’s important to prepare with adequate research so you know what to expect. Familiarize yourself with common nicotine withdrawal symptoms, such as irritability, fatigue, headaches, dizziness, and insomnia, so that you’re not surprised by how you’re feeling. By preparing yourself for withdrawal symptoms and researching medications, foods or behaviors that will reduce them, you’ll be less likely to reach for a cigarette. Remember that not all your research has to be done online. Talk to friends who have successfully quit smoking to learn about their experience. You may be surprised at how many tries it took them to quit and the methods they implemented to curb cravings. Set a quit date within two weeks after you start planning your quit journey. Consider quitting on a day you won’t face too many temptations, such as get togethers with friends, or stressors, like work deadlines or moving dates. For many people, the first few days after quitting are the hardest, so avoiding temptations early on is a vital part of staying on track. Before your quit day, remove common smoking reminders from your home, car, and workplace. Common smoking reminders include matches, ashtrays, cigarette butts, and clothing that smells like tobacco, such as the jacket you usually wear on smoking breaks. Replace smoking reminders with items that can help reduce cravings, like straws, chips, and nicotine gum. Being aware of potential triggers is the first step to overcoming them. Think of environments or feelings that make you want to smoke. These may include emotional triggers, such as stress, anxiety, boredom, or anger, habitual triggers, such as drinking coffee or alcohol, finishing a meal, driving, or watching TV, and social triggers, such as going to a bar, being offered a cigarette, or simply spending time with friends who smoke. Create a strategy for overcoming triggers so you’re not taken off guard the first time you encounter one. Create a list of things that can help you overcome the urge to smoke for each specific trigger. For example, in high-stress situations, plan to get a drink of water and meditate instead of reaching for a cigarette. Similarly, when you’re watching TV or you’re bored, find a crunchy snack like popcorn to keep your hands and mouth busy, and your mind off smoking. Changing your diet and implementing healthy eating habits can also help to overcome triggers and cravings. Check out our previous blog post for a list of foods that can help you quit smoking and stay smoke-free. Let your family and friends know you are trying to quit. If they are aware of your quit date, they will be less likely to offer you a cigarette, and they may even join your quitting journey. Quitting with a friend or family member can provide many benefits, such as tips for overcoming cravings and motivation to stay on track. 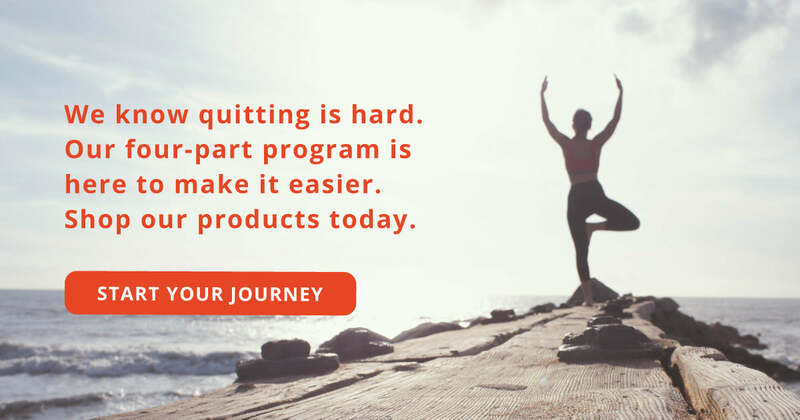 Implementing quitting aids, such as our four-part program, is a vital part of overcoming nicotine addiction. Libertas Resist capsules are an all-natural, doctor-approved blend of vitamins designed to reduce nicotine cravings. When used with Libertas Replenish, Restore, and Revitalize, your body will regain vital nutrients and minerals smoking has depleted from your body, and will give you the strength you need to achieve the smoke-free life you’ve been waiting for. Shop our products today and learn more about our support services to start your journey!